Since June 2016 politics has been dominated by arguments about which kind of Brexit deal we’re going to get. The narrow public vote to leave the European Union stopped business as usual, making it harder to get a hearing for policies to address systemic problems in our economy, public services and society. As more assessments have been done, including by the government and Office for Budget Responsibility, it has become evident that all Brexit deals will make Britain poorer. Arguments about what Brexit deal we have are all arguments about how much we lose, and who loses most. And we all know from bitter experience, that the poorest and most vulnerable will be asked to bear the brunt of it. If Labour had been in government we would have led the negotiations differently, and very likely have got to a better outcome. But we’re out of time. The only Brexit deal on offer is the one that Theresa May is stumbling towards. If Labour continues to argue for alternative Brexit strategies, for which there is no majority in parliament, we will end up with the Tories’ Brexit. Only clear opposition to their deal can unite support and offer a clear alternative to the country. There is unlikely to be a general election before 2022. Given the fixed term Parliament Act it would require the agreement of half the Tory party – and the threat of a Corbyn government is far worse for the Tories and the interests they represent than a botched Brexit. Labour must prepare for power in 2022 – by which time Brexit will be a fait accompli, unless it is stopped. If Tory Brexit goes ahead we know from impact reports that jobs will go, businesses will close and the tax receipts that pay for public services will be badly hit. Business is already close to pulling the plug. The Tories will embark on a set of disaster capitalist policies ‘to keep Britain competitive.’ Unfortunately we’ve seen from reactions to the financial crisis how economic and social damage pushes people to the right, not the left – Labour could still lose support after a damaging Brexit if we don’t have the right strategy. We cannot ignore the fact that large numbers of people in Labour seats voted Leave in 2016, but we also cannot ignore the fact that Tory Brexit would only harm these families and communities – costing jobs, public services and risking their children’s futures. Labour’s radical policies would help put communities back on a sure footing – with investment in social housing, a national education service and regional investment banks we would change lives for the better. Unfortunately the message isn’t getting through – we’re losing support among working class voters. Opposing Tory Brexit would give Corbyn a clear narrative – ending their crusade to create a low tax, low regulation, low security country with all the human costs that would follow. Brexit as it stands is an undeniably right wing project, aimed at valorizing an imperial past and blaming immigrants for society’s problems. As a party of the left, we have both a moral duty and an electoral interest in beating that narrative. Fighting Tory Brexit, and leading the public in a People’s Vote to stop it, would give Corbyn’s Labour the ideal platform to explain how Labour’s policies would bring security and prosperity, in contrast to the Tories’ planned disaster capitalism. There aren’t enough Tory rebels to trigger a general election, but there are enough to get a People’s Vote. 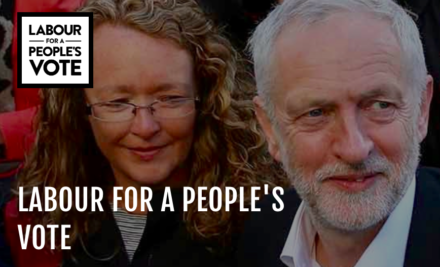 Labour for a People’s Vote represents Labour members coming together to urge the movement of which we are a part to oppose the Tories’ destructive Brexit and unite the country behind a radical and hopeful vision for the future. To get involved, sign our statement or download our CLP motion to submit to your branch or CLP. Mike Buckley is the founder of Labour for a People’s Vote and a Labour activist from Sheffield.